Once upon a time, growing your own organic veggies might have been considered a bit radical. Nowadays, growing organic greens doesn't make you a wild-eyed hippie; it just shows you're a clever clogs who knows about healthy eating. Our Organic Veggie Mix is suitable for growing only one type of veggie and that type is... delicious. Joking aside, you can actually grow ALL kinds of delicious veggies with this amazing mix. Plus, it's 100% weed-free, so none of those will end up in your salad. Kicking things off, we begin with our famous Living Earth Organic Compost. There's a good reason it's the basis of all our mixes; it is rich with nourishing nutrients that plants love. Then we throw in a dash of Bark Fines to add a bit of substance, and then some Pumice so the mix drains like it's supposed to. Finally, the pièce de résistance: an all natural Organic Fertiliser. Ooh la la! Use Organic Veggie Mix in garden beds and planters to a depth of at least 200mm. 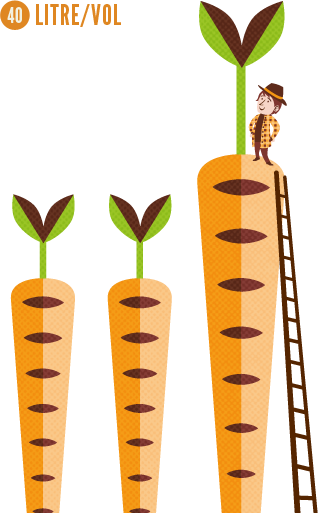 Plant your veggies or sow seeds directly into the mix and water well. Feed with Living Earth Organic Liquid Compost every fortnight. (Or if you can't remember that, do it every two weeks instead). 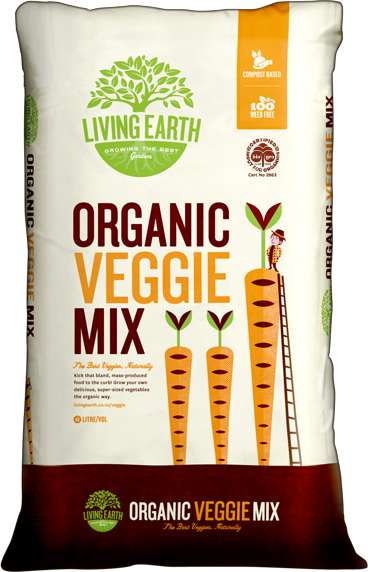 Re-apply Living Earth Organic Veggie Mix after the growing season to top up the organic matter in your veggie garden.